The pharmaceutical industry is currently operating under a business model that is not sustainable for the future. Given the high costs associated with drug development, there is a vital need to reform this process in order to provide safe and effective drugs while still securing a profit. 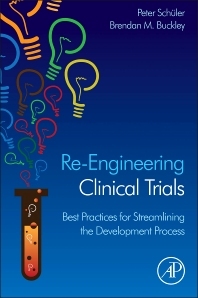 Re-Engineering Clinical Trials evaluates the trends and challenges associated with the current drug development process and presents solutions that integrate the use of modern communication technologies, innovations and novel enrichment designs. This book focuses on the need to simplify drug development and offers you well-established methodologies and best practices based on real-world experiences from expert authors across industry and academia. Written for all those involved in clinical research, development and clinical trial design, this book provides a unique and valuable resource for streamlining the process, containing costs and increasing drug safety and effectiveness. Section 1. Why Does the Industry Need a Change? Chapter 1. Why Is the Pharmaceutical and Biotechnology Industry Struggling? Chapter 2. What Are Current Main Obstacles to Reach Drug Approval? Chapter 3. Japan: An Opportunity to Learn? Chapter 6. How Can the Innovative Medicines Initiative Help to Make Medicines Development More Efficient? Chapter 13. What Makes a Good Protocol Better? Peter Schüler is Senior Vice President, Global Medical & Safety Services, ICON Plc. Peter is board certified in neurology (1996; German Medical Board) and in Pharmaceutical Medicine (2001; Swiss Medical Association). In 1999 in obtained a Certificate in Business Administration by Henley Management College, UK. After his medical education he started is professional career in 1987 at the Medical Imaging Application Center of Siemens AG Medical Solutions. The same year he started at the Department of Experimental Neuropsychiatry of the Neurological University Hospital Erlangen, Germany. During the coming 8 years he was involved in basic and clinical CNS research. He held the position of Secretary General of the German section of the International League Against Epilepsy (ILAE; 1991-1995) and was awarded two scientific awards (Alfred-Hauptman epilepsy prize and ILAE Young Investigator Award). In 1995 he joined Pharmacia. During that period, he participated in the launch of two NCEs in the indications Parkinson’s and major depression. In October 2000 he moved into the CRO business, building a department for Medical Affairs and also taking over responsibilities for clinical operations in Germany, Austria and Switzerland. In 2007, Peter joined ICON, now overseeing over 360 people located in 11 major offices in Argentina, Brazil, Germany, India, Japan, Latvia, Mexico, Poland, Singapore, UK and US. He issued several publications on drug safety and authored an eBook about clinical trial design and conduct (Zenosis Ltd publisher) and continues to lecture Pharmaceutical Medicine at the Universities of Duisburg-Essen, Germany and Aveiro, Portugal. Brendan Buckley is Chief Medical Officer of ICON Plc. He was previously a co-founder of Firecrest Clinical. He is a Honorary Clinical Professor in the School of Medicine at University College Cork Ireland. A medical graduate of the National University of Ireland and a doctoral graduate in Biochemistry of Oxford University, he has over 30 years’ experience in clinical pharmacology research. Prior to joining ICON, he was Director of the European collaborative Centre for Clinical Trials in Rare Diseases at Cork. He was a member of the EMA Committee for Orphan Medicinal Products (COMP) from 2000-2003 and a member of the EMA Scientific Advisory Committee on Diabetes and Metabolism until 2011. He was a member of the Board of Directors of the Irish Medicines Board, the national competent authority for Ireland, 2004-2011 and chaired its statutory Advisory Committee for Human Medicines. He is chairman of the independent data and safety monitoring boards for a number of large clinical trials programmes with several sponsors. He is a member of the scientific advisory boards of a number of research charities and honorary Director of the Cork Cancer Research Centre. Professor Buckley is a Fellow of the Royal College of Physicians of Ireland, of the College’s Faculty of Pathology and a Fellow of the Faculty of Sports and Exercise Medicine.